2019 spring time Texel island activity run from April 13th until 22nd. Call sign is PD/DO1BEN. 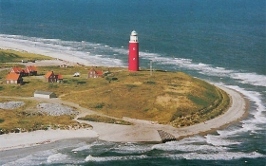 Texel is located in the northern part of The Netherlands in the Wadden See. Texel Island is IOTA Ref. : EU-038. There is also a Lighthouse on the Island. It's valid for World Lighthouse On The Air award. TRX is Yaesu FT2000. I use self made vertical antenna for 20 meters. And for 40 meters i have set up a inverted V (wide space) dipole. Activities are mainly in digimodes (RTTY and PSK31/63), and also sideband operations. Hope to see you all down the log. Former activities , from the same place, where in 2009, 2010, 2011, 2012, 2013, 2014, 2015, 2016, 2017 (two activities in spring time and in fall) and 2018. Some picts (2017) from our location and our tours are availabe here: - pse click here - . QSL card. QSL via homecall.